“The thing that kept coming up for me afterwards was the sound of the helicopter,” says Amber Sample, 33. “That sound is what started all the healing.” Amber and her husband, James, live in Placerville, California. They moved from the San Francisco Bay Area to this El Dorado County community of 10,000 to raise their children Zane (6), Kambryn (4 ½), Kason (3) and Zyli (4 months). As it turned out, the pool party ended earlier than expected when it became obvious a thunder storm was brewing. As the guests finished packing up their belongings, someone noticed something in the pool. Amber says, “I looked up and the last few minutes flashed in my mind—‘mommy me hungry’…‘floatie off’…and I realized it was Kason.” She immediately dove into the pool and swam to her son. “He was completely lifeless,” she says. Amber started screaming for help and a friend, realizing what was going on, ran over to help pull Kason out of the pool. 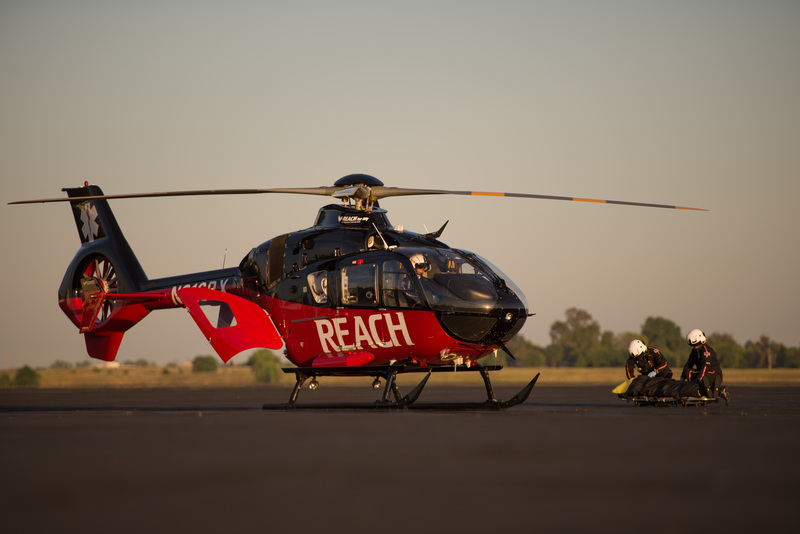 The REACH 17 crew tends to a patient. When fire and ambulance arrived, REACH Pilot Pat Williams was already circling the scene. A landing zone had been set up at a nearby church. Paramedics loaded Kason onto the ground ambulance and drove him to the aircraft. 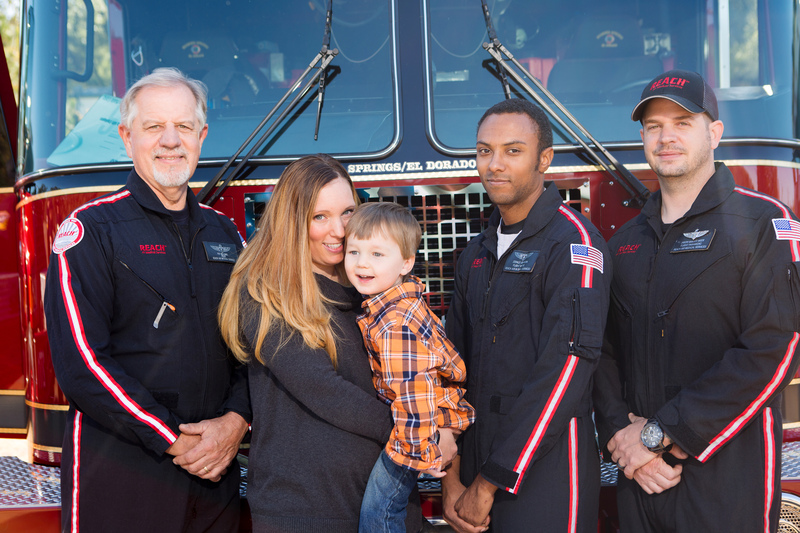 There, REACH Flight Nurse Jerald Johnson and Flight Paramedic Jason Vander Meer took responsibility for Kason’s care. The helicopter took off just seven minutes after landing. Jerald and Jason cared for Kason while Pat safely flew them to UC Davis Medical Center, an acute care teaching hospital that could give Kason the specialized care he needed. L to R: Pilot Pat Williams, Amber and Kason Sample, Flight Nurse Jerald Johnson, Flight Paramedic Jason Vander Meer. Kason remained intubated for only about 32 hours, so his stay in the PICU was brief. “The people from PICU were crying because they just couldn’t believe he made it into regular pediatric care so fast,” says his mom, who noticed something very intriguing after Kason’s breathing tube was removed. “He came out of sedation speaking sentences that he had never spoken before,” she shares. “His vocabulary and his speech are better than they used to be.” She also reports that Kason has never appeared to have any nightmares after the accident. He remembers many things from that day. “When they woke him up, I told him he was in the hospital. I told him, ‘Mommy had to breathe for you,’ and he said, ‘Mama, big jump! Close eyes!’ I think he went down the slide, because he’s done that before.” And like his mother, Kason remembered the sound of the helicopter. The very first time she mentioned it, he said, ‘Yeah! Helicopter loud!’ “He talks about the helicopter often,” she reports. 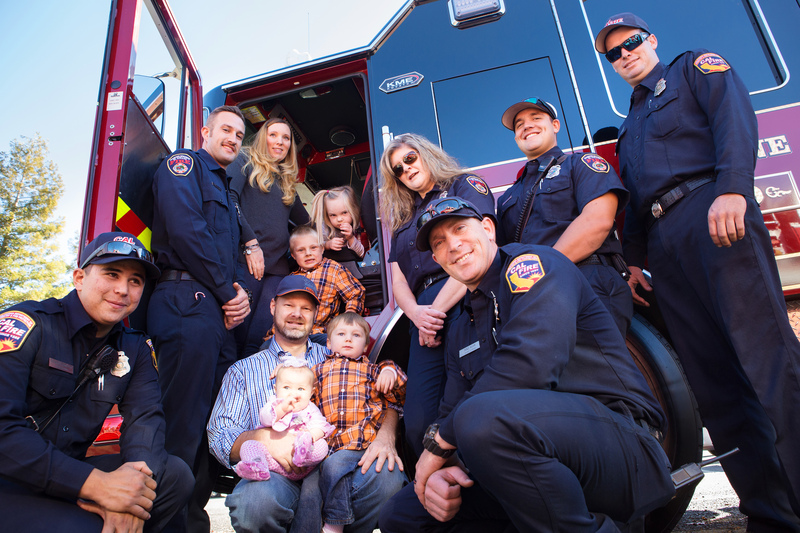 The Sample family with a few of Kason's rescuers.